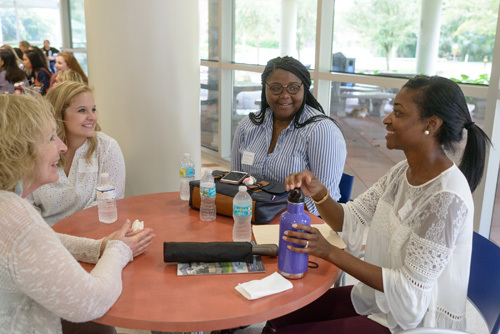 Ke’Andra Clayton, right, is part of the inaugural class in the new doctor of occupational therapy program at the UF College of Public Health and Health Professions. Ke’Andra Clayton wanted nothing to do with science in 2007 when she arrived at the University of Florida as an undergraduate business major and education minor. But life had other plans for her. Clayton, now 30, is back on the UF campus, this time studying neuroscience and pathophysiology as part of the inaugural class in the new doctor of occupational therapy program at the UF College of Public Health and Health Professions. As an undergraduate, Clayton worked part time with the Extended Day Enrichment Program, or EDEP, in Gainesville. After graduating, she decided to stay with EDEP as an activity leader while also working as a substitute teacher, where she mainly filled in at special needs classrooms. Clayton went on to serve as intern coordinator at Fort Clarke Middle School in Gainesville before taking a job as an after-school coordinator at what is now the Duval Early Learning Academy in Gainesville. Pursuing a teaching certificate had always been in the back of her mind, Clayton said, and with the encouragement of several school leaders, she decided to go for it. After becoming a certified teacher, she was offered a job at Littlewood Elementary School in Gainesville teaching special needs pre-kindergarten students. These interactions with therapists who were striving to better the lives of special needs children brought Clayton back to UF – this time to pursue a doctorate in occupational therapy. Clayton took prerequisite night classes at Sante Fe College for two years while teaching full time before beginning the UF OTD program in August. Now, Clayton keeps pictures of her students on her notebooks to remind her of why she’s here. After graduation, Clayton hopes to focus on pediatric occupational therapy. 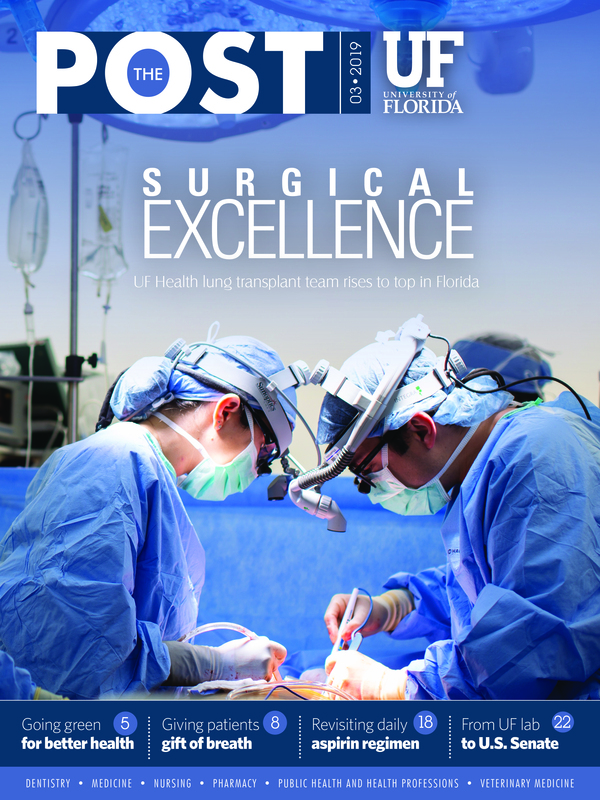 This is the first year that UF is offering the OTD program, which replaced the master’s degree program. That’s exactly why UF made the change, said Christine Myers, Ph.D., a clinical associate professor in the department of occupational therapy and director of the new program, the first at a public university in Florida. The switch to a doctorate program began four years ago when leaders of the department of occupational therapy decided they wanted to provide students with skills they were not available in a master’s program, Myers said. “The main impetus for beginning the program was to get our students at the highest level they could be when they graduated so they could be leaders in our profession and understand how to use evidence and science to make clinical decisions,” she said. Clayton was a perfect candidate for the program, Myers said, because she has experience working with children with disabilities, with teams of professionals and with families. And Clayton was excited to be back on the UF campus. Clayton credits where she is now to her experiences as a teacher and to the students who continue to inspire her.